Turn your heater on to "HI" and poor in the wax pearls. Wait for the pearls to melt all the way through. Then turn the heat down to "MED". We recommend that you stir the wax, and check the wax's temperature and consistent on the back of your hand. It should be as warm possible - without causing burns of cause. Use the included application spatulas to apply the wax. We recommend laying the wax on the skin with the direction of the hair. Wait 30-60 seconds until the wax has clotted. When the wax has clotted, pull the wax in one quick movement against the direction of the hair. We recommend treating your skin with some moisturiser or Aloe Vera Gel after the treatment. Are you a first-time user of PearlWax it's quite normal that your skin will react and be irritated. A moisturiser or Aloe Vera Gel will help calm the skin back down. The most important criteria for a great wax treatment is to find the right temeperature for your skin. Often the right temeperature is between "MED" and "HI" and we recommend you experiment and find the right one for you. If the wax is not hot enough it will lay on top of the hair instead of grabbing the hairs. If you experience that wax is not pulling all the hair out it is 9 out of 10 times because the wax is not hot enough. But make sure it not too hot either. It is actually not necessary to clean your heater after use. Just let the wax cool off and warm it up again next time you use it. To avoid bacterias we recommend that you have the lit on during the heating of the wax, the down cooling and when you store it. Let the remainings of the wax stay in the heater until next time. When it's finally time to wear skirts, shorts and bathing suits, it is a much better idea to be waxing than using the old fashioned razors. unfortunately wax treatments at beautysalons are very costly and after 3-4 weeks, you have to go back and do it all over again. That is why you need to be waxing at home! Maybe you think it hurts too much? or maybe you think it is diffifult? 1) How long should the hair be for optimal effect? 2) Do i have to anything before the treatment? You don't have to, but we recommend doint it! The day before you have planned to do the treatment, we recommend that you exfoliate the skin that will be waxed. 3) When is the best time to wax? We don't know your work schedule, but we recommend doing it, when you have some time on your hands. To get the most out of your Pearlwax, you should take good time and don't rush through your treatment. Make a thing out of it! Light a few candles, put on some music and enjoy a bit of alone time. 4) How do i use the wax? This is of cause the most essential question! You must apply the wax with the direction of the hair. Make sure the layer you apply is not too thin or too thick. It is very easy to feel, when your hairs think the layer is too thick. Afterwards you need too stretch the skin around the applied area og pull the wax in the opposite direction of the hair. Do it all in one smooth and quick motion! Remove all danger of nasty shaving rashed and get waxed. The hairs will get finer with time. A GOOD TIP: The hairs should be around 3-5 mm. to get the best results. Get nice feminin arms. This treatment will give you the final touch for a party, an important night out or at your wedding. You will be better groomed and your outfit will shine even brigther! Your arms will be beautiful and clean. Use a nice moisturiser or an Aloe Vera gel after your treatment, and your skin will look amazing! When the hair grows out again, it will never get as thick as before. Are you sick and tired of using a shaver every other day and get irritated skin and shave rashes everytime? Then this wax treatment is the right one for you! We use this special pearlwax treatment for delicate areas, to make the hair removal experience much more quick and less painful. We recommend using a calming moisturiser after treatment or an Aloe Vera Gel. This treatment is suitable for you who need to wax more than just the upper lip and chin. For example, it could be cheeks, barts, or throats. Are you particularly bothered by unwanted hair growth, and it annoys you so much that you notice it in the mirror? Many women are bothered by unwanted hair growth, but it is treatable. Let PearlWax help you with the hairs. We recommend the chamomile wax for such delicate areas. Finish off with soothing aloe vera cream. By continuous waxing every 4 weeks, one can be lucky to reduce hair growth and hair color over time. This treatment is for girls and women of all ages. PearlWax is based on natural wax from bees. The beeswax makes the hot wax stick to the hairs only and not the skin. This results in a far more flattering and durable result and can save your skin from much wear. 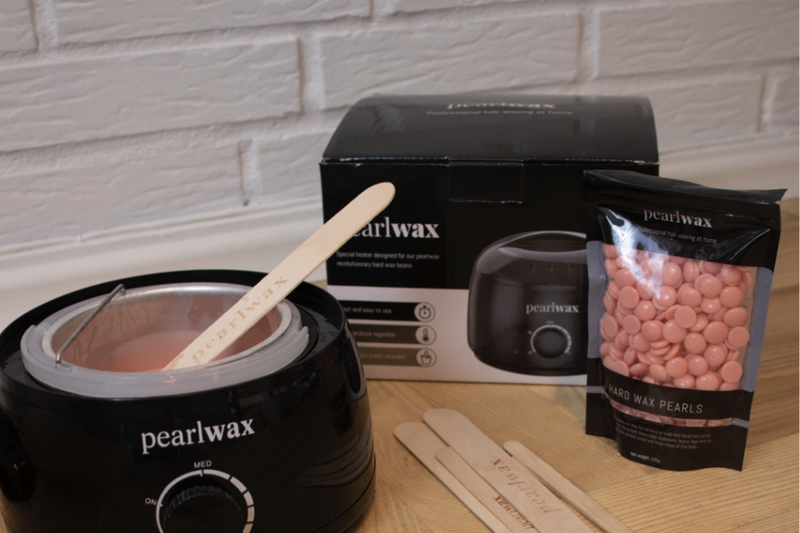 PearlWax can be used by all skin types as the wax is gentle to the skin. This means that with PearlWax you will avoid small irritation buds, beard plague and ingrown hairs that are expected with normal shaving. The more times you wax, the fewer hairs grows out and the hairs get thinner. With regular shaving, you will quickly feel the hairs again. You can feel the stumps after shaving, but with PearlWax you can enjoy your soft smooth skin for up to four weeks when waxing depending on hair growth. PearlWax is a relatively new phenomenon that has become popular worldwide because of the spread of the message through social media. There is a reason why the new hair removal method is a hit - try it yourself! Our delivery takes 2-4 days when your order has been confirmed. We ship from Denmark. What do you mean by "satisfaction garanteed"? If you are not happy with the product you can return it and receive a refund - even if the product has been used!